Author(s): Jesse Roman. Published on September 4, 2018. Audio: Listen to this article as read by the author. In early August, a small sedan rammed into a group of students on the leafy campus of Missouri State University in Springfield. The driver exited the vehicle brandishing a semi-automatic rifle and opened fire. Within minutes, personnel from campus rescue agencies and the surrounding area swarmed the scene. Vaping devices raise a number of safety concerns on college campuses. As 3D printers become popular with students, campus officials raise concerns over health and safety. Fire remains an ongoing concern—especially in off-campus housing. 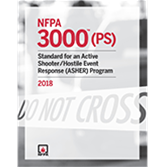 Learn more about NFPA 3000™ (PS), Active Shooter/Hostile Event Response (ASHER) Program, and related resources and training. While police worked to neutralize the shooter threat, firefighters accompanied by police ran onto the scene to apply critical first aid, then rushed the victims to emergency medical technicians waiting in a staging area. Victims were loaded into ambulances and transported to two local hospitals, which had been alerted of the attack and were ready to receive the injured. The attack didn’t make the news because it was staged—a training exercise with a volunteer assailant and victim actors. But for responders, the drill was still deadly serious. With the United States beset by violent and fatal shooting attacks, coordinated exercises like these between campus security and local agencies, designed to plan and rehearse for mass violence incidents, are now viewed as essential components to emergency planning on college campuses. Since the 2007 campus shooting at Virginia Tech that killed 32 students and faculty, security measures and preparation for attacks on campuses across the nation have ramped up significantly. Many schools have hired emergency managers, implemented new technologies, and have invested in sophisticated mass communication systems. In May, NFPA released NFPA 3000™ (PS), Active Shooter/Hostile Event Response (ASHER) Program, which schools are starting to look to for guidance. Many universities have also increased training and cooperation with local agencies, and have undertaken more aggressive outreach campaigns to train students, faculty, and staff about how to respond in the event of a shooting or act of terror on campus. At some schools, incoming freshman are now being taught at orientation what to do if a person opens fire in a residence hall—information presented alongside how to register for classes and the hours of the dining hall. The urgent need for coordinated planning and response prompted the development of NFPA 3000™(PS), Standard for an Active Shooter/Hostile Event Response (ASHER) Program. Such information is in high demand, said Alan Sactor, fire marshal at the University of Maryland and assistant director for the university’s Office of Emergency Management. “Active shooter is the topic we get the most inquiries about from the university community and administration, and I think that’s the way it is in most colleges and universities,” he told NFPA Journal. You can pinpoint the exact day when universities across the U.S. began scrambling to address active shooter threats: April 16, 2007. That morning, a mentally ill student at Virginia Tech opened fire with two semi-automatic pistols on the Blacksburg, Virginia, campus, killing 32 people and injuring 17 more in what was at the time the deadliest mass shooting committed by a lone gunman in U.S. history. The shootings took place in two buildings, two hours apart, beginning about 7:15 a.m. and ending when the shooter killed himself just before 10 a.m. Students were first informed of the first attack via email at 9:26 a.m., two hours after it occurred. Since then, active shooter events in the U.S. have become more frequent and, in general, more severe. According to the Federal Bureau of Investigation, between 2000 and 2017 there were 250 active shooter incidents in the U.S., defined as one or more individuals actively engaged in killing or trying to kill people in a populated area. Fifty of those incidents, or 20 percent, have occurred in just the last two years, resulting in 221 deaths and 772 wounded. There were 15 active shooter attacks on college campuses between 2000 and 2017, according to the FBI. After Virginia Tech, colleges and universities began investing more heavily in security and training to bolster campus security, said Sactor, who has worked in emergency management at Maryland for more than three decades. Citing Virginia Tech’s delay in alerting students, many universities, including Maryland, first took a hard look at their own emergency notification systems, Sactor said, and invested in new text and computer alerting systems. Security cameras on campuses also became more prevalent, and universities began implementing more sophisticated key card systems to further limit access to buildings and more accurately track the movement of people. More time and resources were also poured into training staff and developing comprehensive active shooter response plans. Still, campus shootings continued. According to a study by Collegiate Times, there have been 172 shooting incidents on college campuses (defined as one or more people shot by a firearm), since the Virginia Tech shooting in April 2007. In total, 122 people have been killed and 198 people injured by gunfire on college campuses over that timeframe, the publication found. Numerous factors make protecting campuses and planning for an incident extremely challenging. For one, campuses are like small cities with numerous buildings, occupancies, and public spaces designed to be open and welcoming. Unlike a city, all of the infrastructure is owned and controlled by a single entity—imagine if the city of St. Louis had to oversee and manage the security and emergency planning for every apartment building, hospital, office building, stadium, concert hall, restaurant, and research lab within its city limits. Universities and private organizations are working on many fronts to address these challenges with advancements in technology, planning, and education. NFPA 3000, a standard aimed at helping communities, organizations, and agencies craft plans to respond and recover from active shooter incidents, lays out a comprehensive set of guidelines covering all aspects of preparedness, from competencies responders should have to handle these events to facility preparedness, resource management, communication, family notification services, and more. College emergency managers have been among the most engaged and vocal constituencies, both during the creation of the standard and since its release, said John Montes, the NFPA staff liaison who has helped guide NFPA 3000’s development. Despite it being only a few months old, several schools, including Missouri State, Virginia Tech, and Harvard, have begun incorporating parts of the document into their planning. One of the pillars of the NFPA 3000 ASHER program is a “whole community” approach; in short, the need for all agencies in a community to plan, train, and cooperate extensively together before an event, and a need for the general public to be more alert and aware of what to do when an incident takes place. Because of the insular and self-contained nature of some colleges, the integration of local fire and law enforcement into planning might not be as strong as it should be, Montes said. Because the standard is so new, most jurisdictions and universities are still familiarizing themselves with the information in NFPA 3000 and how it might be useful, Montes said. Federal law has long mandated that colleges and university have emergency plans, and the vast majority, if not all, do have some kind of active shooter training and planning document already in place. Where 3000 can have immediate value for campus managers is as a cross-reference, to identify gaps or oversights that may exist in the school’s current plan, Hall said. In addition to guidance from NFPA 3000, many new technologies have emerged to combat campus violence. Security equipment and services sales to the education sector rose to $2.7 billion in 2017, up from $2.5 billion in 2015, according to HIS Markit, a data and analysis firm. Universities now employ a range of technologies, from cameras that automatically capture the license plate numbers of all vehicles coming and going from campus to state-of-the-art gunshot detection systems. At the University of Maryland, sensors strategically placed around campus can detect a gunshot, triangulate its precise location, and within a minute send an alert to campus security and local law enforcement with a map of where the incident occurred. For instance, he thinks ballistic film on entrance doors will become more widely used—preventing potential attackers from gaining entry by shooting through the glass—and so will remotely activated locks. “From a practical standpoint, if you have an active shooter situation, how do you get exterior doors locked in 100 different buildings, each with three entrance points?” Hall said. Newer alarm systems, which enable emergency managers to speak directly to building occupants and provide different messages to different buildings, are also beginning to gain popularity. Hall dreams of a world where technologies such as geo-fencing will allow him to send specific messages to all people within an invisible boundary: one message for a person in this residence hall, a different text message to people in another, both tailored to the location-specific threats in each. The components to better address active shooter threats—the standards, procedures, technology, building designs, and societal training—are beginning to come faster as society adjusts and attacks become more commonplace, Hall said. It’s sometimes easy to forget how relatively new these events are, and like any emerging threat, it takes time to learn how best to combat it.